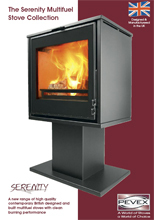 The Serenity 40 is available with a log store and full glass window option to give a stunning stove for either a free standing open plan setting or installed into a fireplace. Incorporating the same firebox technology that is built-in across the range, these stoves continue to give a lovely flame pattern and a warm radiant and convection heat. The Serenity 40LS log store option offers a handy storage area for a quantity of stoves to be stored whilst the Serenity 40FW has a full glass window with a store for logs behind the door. High efficiency, complete controllability and stunning design ensures that these stoves will look great and offer a lovely centre piece in any room setting.